This . . . hold onto your hats . 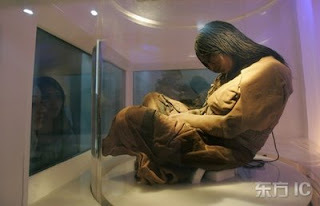 . . is a 500-year-old mummy. All of you who think the Egyptians had a monopoly on mummies, it's time to think again. Whether they were created by man or nature, mummies have been found around the globe--in China, Peru, America, Italy, and countless other countries. 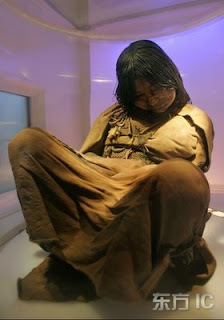 Thousands of Inca mummies have been discovered over the years, though few are as perfectly preserved as The Maiden. However, a Chinese mummy in a similar condition plays a starring role in The Empress's Tomb. But more on THAT later. Sick and cool at the same time!!! Whoa, I first thought that was just some elderly lady sitting weirdly... the title fits perfectly. Go Empress's!!!! The Egyptians' process of mummification is so sick, yet so intruding. How they managed to preserve their body's so well, the world may never know. guess what??? a new member of my family was just born!!!! HAPPY DAY!!!!! That's fantastic, International Mastermind. I hope she or he takes after you. Congrats! Pleez post again! i miss you!!!! How could I possibly turn down someone named monkeyluva! (Love it!) Look for new posts later today. omg that is soooooo incredible! you can even see what her face looked like!!!!!!! !